Lebanese Shia Muslims refers to Lebanese people who are adherents of the Shia branch of Islam in Lebanon, which is the largest Muslim denomination in the country tied with Sunni Muslims. Shia Islam in Lebanon has a history of more than a millennium. According to the CIA World Factbook, Shia Muslims constituted an estimated 28.4% of Lebanon's population in 2017. Most of its adherents live in the northern and western area of the Beqaa Valley, Southern Lebanon and Beirut. The great majority of Shia Muslims in Lebanon are Twelvers, with an Alawite minority numbering in the tens of thousands in north Lebanon. Few Isma'ilis remain in Lebanon today, though the quasi-Muslim Druze sect, which split from Isma'ilism around a millennium ago, has hundreds of thousands of adherents. Under the terms of an unwritten agreement known as the National Pact between the various political and religious leaders of Lebanon, Shias are the only sect eligible for the post of Speaker of Parliament. The cultural and linguistic heritage of the Lebanese people is a blend of both indigenous Phoenician elements and the foreign cultures that have come to rule the land and its people over the course of thousands of years. In a 2013 interview the lead investigator, Pierre Zalloua, pointed out that genetic variation preceded religious variation and divisions: "Lebanon already had well-differentiated communities with their own genetic peculiarities, but not significant differences, and religions came as layers of paint on top. There is no distinct pattern that shows that one community carries significantly more Phoenician than another." Haplogroup J2 is also a significant marker in throughout Lebanon (~30%). This marker found in many inhabitants of Lebanon, regardless of religion, signals pre-Arab descendants, including the Phoenicians/Aramaens. These genetic studies show us there is no significant differences between the Muslims and non-Muslims of Lebanon. Genealogical DNA testing has shown that 21.3% of Lebanese Muslims (non-Druze) belong to the Y-DNA haplogroup J1 compared with non-Muslims at 17%. Although Haplogroup J1 finds its putative origins in the Arabian peninsula, studies show that it has been present in the Levant since the times of the Canaanites and does not necessarily indicate Arab descent. Other haplogroups present among Lebanese Shia include E-M35 (19%), G-M201 (8%), R1b (6.7), and others at less frequencies. Genetics aside, the population of pre-Islamic Lebanon was mainly Phoenician who began to speak Aramaic. Under Byzantine rule, this Aramaen population was Hellenized and adopted the Greek language alongside their native Aramaic. It is important to note that most villages and towns in Lebanon today have Aramaic names, reflecting this forgotten heritage. Alongside the natives, small pockets of Greeks, Arabs, and Persians moved in and assimilated into the population. Amongst these pre-Islamic Arabs, Banu Amela has importance for the Lebanese Shia for adopting and nurturing Shi'ism for the southern population. As the Islamic expansion reached Lebanon, these Arab tribes received the most power which encouraged the rest of the population to adopt Arabic as the main language. Many historians claim that Shia Islam entered Lebanon in the 7th century A.D. with the emergence and growth of Islam. The emergence of the Lebanese Shia community began with the entrance of the revered companion of the Prophet, Abu Dhar al-Ghifari. After having been banished from Medina by the Umayyads for opposing their reign, Abu Dharr moved into Lebanon and converted the local populace. There are two Shia shrines to Abu Dhar in Lebanon — in Sarepta and Meiss al-Jabal. A Shia emirate was established in Keserwan, a mountain region overlooking the coastal area north of Beirut, in which they prospered for the next five centuries. The growth of Shia Islam in Lebanon stopped around the late thirteenth century, and subsequently Shia communities decreased in size. This development may be traced to 1291, when the Sunni Mamluks sent numerous military expeditions to subdue the Shias of Keserwan, a mountain region overlooking the coastal area north of Beirut. The first two Mamluk expeditions were defeated by the Shia in Keserwan. The third expedition, on the other hand, was overwhelmingly large and was able to defeat the Shia in Keserwan; many were brutally slaughtered, some fled through the mountains to northern Beqaa while others fled moving through the Beqaa plain, to a new safe haven in Jezzine. Keserwan began to lose its Shia character under the Assaf Sunni Turkomans whom the Mamluks appointed as overlords of the area in 1306. The process intensified around 1545 when the Maronites started migrating to Keserwan and Jbeil, encouraged by the Assafs, who sought to use them as a counterweight to the Shia Himada sheikhs who reemerged in Keserwan in the 16th century. When in 1605 the Druze emir Fakhr al-Din Ma'n II took over Keserwan, he entrusted its management to the Khazin Maronite family. The Khazins gradually colonized Keserwan, purchasing Shia lands and founding churches and monasteries. They emerged as the predominant authority in the region at the expense of the Shia Hamedeh clan. By the end of the eighteenth century, the Khazins owned Keserwan and only a few Shia villages survived. Tradition tells us that many Shia of Keserwan also adopted Christianity after heavy persecution and many Maronites of the region today are their descendants. During the time of the Ottoman Empire, the Shias suffered religious persecution and were often forced to flee their homes in search of refuge in the South. In response to the growth of Shia Islam, the Ottoman Empire put Shias to the sword in Anatolia. Hundreds of thousands of Shias were massacred in the Ottoman Empire, including the Alevis in Turkey, the Alawis in Syria and the Shia of Lebanon. One example is the Lebanese city of Tripoli, which had formerly had a Shia Muslim majority. Many Lebanese Shia are rumored to have concealed their religious sect and acted as Sunni Muslims in fear of persecution. It is also rumored[by whom?] that some of the Shia permanently adopted the Sunni Muslim sect. The Ottomans and Druze were well allied and a Druze family seized power of Tripoli. Maronites who were persecuted by the Ottomans and the Druze, sought refuge amongst the newly relocated Shia population in the South. Jezzine, once famously known as a Shia capital in Lebanon, is now known as a majority Maronite and Melkite Christian city in the South. The Shias withdrew further south and eventually had to abandon even Jezzine, which until the mid-eighteenth century had functioned as a center of Shia learning in Lebanon. The traditional accounts of Shia "persecution" in Lebanon, however, which are largely based on family legends, are seriously called into question by the Ottoman documentation available in the state archives in Istanbul or local sharia archives in Tripoli. According to these, leading Shia families such as the Hamadas in Tripoli, the Harfushes in the Beqaa or the Ali al-Saghirs in Jabal 'Amil were co-opted into the Ottoman system of government, serving as tax farmers (multezim) over huge areas and enjoying other government offices (sancak-beylik governorships, etc.) in the region. Although the Jabal 'Amil enjoyed a degree of autonomy in the eighteenth century under the leader of the Ali al-Saghirs, Nasif al-Nassar, and the Arab leader of northern Palestine, Zahir al-Umar, this ended with the Ottoman appointment of Ahmad al-Jazzar as governor of Sidon province (1775–1804). Jazzar crushed the military power of the Shia clan leaders and burned the libraries of the religious scholars using the Druze tribes established in the Shouf, mainly the strong Nakad family, allied to the Maan. He established a centralized administration in the Shia areas and brought their revenues and cash crops under his domain. By the late eighteenth century, the Shias of the Jabal 'Amil lost their independent spirit and adopted an attitude of political defeat. Al-Jezzar was nicknamed "the butcher" and a big population of the Shia were killed under his rule in Lebanon. During most of the Ottoman period, the Shia largely maintained themselves as 'a state apart', although they found common ground with their fellow Lebanese, the Maronites; this may have been due to the persecutions both sects faced. They maintained contact with the Safavid dynasty of Persia, where they helped establish Shia Islam as the state religion of Persia during the Safavid conversion of Iran from Sunni to Shia Islam. Since most of the population embraced Sunni Islam and since an educated version of Shia Islam was scarce in Iran at the time, Isma'il imported a new Shia Ulema corps from traditional Shiite centers of the Arabic speaking lands, such as Jabal Amil (of Southern Lebanon), Bahrain and Southern Iraq in order to create a state clergy. Isma'il offered them land and money in return for loyalty. These scholars taught the doctrine of Twelver Shia Islam and made it accessible to the population and energetically encouraged conversion to Shia Islam. To emphasize how scarce Twelver Shia Islam was then to be found in Iran, a chronicler tells us that only one Shia text could be found in Isma'il's capital Tabriz. Thus it is questionable whether Isma'il and his followers could have succeeded in forcing a whole people to adopt a new faith without the support of the Arab Shia scholars. These contacts further angered the Ottoman Sultan, who had already viewed them as religious heretics. The Sultan was frequently at war with the Persians, as well as being, in the role of Caliph, the leader of the majority Sunni community. Shia Lebanon, when not subject to political repression, was generally neglected, sinking further and further into the economic background. Towards the end of the eighteenth century the Comte de Volmy was to describe the Shia as a distinct society. The Shias in Lebanon were the first to resist the French occupation. Following the creation of the French mandate, armed rebels led by Adham Khanjar and Sadiq Hamzeh attacked French positions in Southern Lebanon, including an unsuccessful attempt on French High Commissioner Henri Gouraud in which Khanjar was captured and later executed. Shia Twelvers in Lebanon refers to the Shia Muslim Twelver community with a significant presence all over Lebanon including the Mount Lebanon (Keserwan, Jbeil), the North (Batroun), the South, the Beqaa, and Beirut. Although a significant Shia Twelver population also exists at Aley, Matn, Chouf, Koura, Akkar and Baabda. The jurisdiction of the Ottoman Empire was merely nominal in the Lebanon. Baalbek in the 18th century was really under the control of the Metawali, which also refers to the Shia Twelvers. Metouali, or mutawili, is an archaic term used to was specifically used refer to Lebanese Twelver Shias in the past. Although it can be considered offensive nowadays, it was a way to distinguish the uniqueness and unity of the community. The term 'mutawili' is also the name of a trustee in Islamic waqf-system. Seven Shia Twelver (Mutawili) villages that were reassigned from French Greater Lebanon to the British Mandate of Palestine in a 1924 border-redrawing agreement were depopulated during the 1948 Arab-Israeli War and repopulated with Jews. The seven villages are Qadas, Nabi Yusha, al-Malikiyya, Hunin, Tarbikha, Abil al-Qamh, and Saliha. In addition, the Shia Twelvers in Lebanon have close links to the Syrian Shia Twelvers. There are an estimated 40,000 Alawites in Lebanon, where they have lived since at least the 16th century. They are recognized as one of the 18 official Lebanese sects, and due to the efforts of an Alawite leader Ali Eid, the Taif Agreement of 1989 gave them two reserved seats in the Parliament. Lebanese Alawites live mostly in the Jabal Mohsen neighbourhood of Tripoli, and in 10 villages in the Akkar region, and are mainly represented by the Arab Democratic Party. Bab al-Tabbaneh, Jabal Mohsen clashes between pro-Syrian Alawites and anti-Syrian Sunnis have haunted Tripoli for decades. Isma'ilism, or "Sevener Shi'ism", is a branch of Shia Islam which emerged in 765 from a disagreement over the succession to Muhammad. Isma'ilis hold that Isma'il ibn Jafar was the true seventh imam, and not Musa al-Kadhim as the Twelvers believe. Isma'ili Shi'ism also differs doctrinally from Imami Shi'ism, having beliefs and practices that are more esoteric and maintaining seven pillars of faith rather than five pillars and ten ancillary precepts. Though perhaps somewhat better established in neighbouring Syria, where the faith founded one of its first da'wah outposts in the city of Salamiyah (the supposed resting place of the Imam Isma'il) in the 8th century, it has been present in what is now Lebanon for centuries. Early Lebanese Isma'ilism showed perhaps an unusual propensity to foster radical movements within it, particularly in the areas of Wadi al-Taym, adjoining the Beqaa valley at the foot of Mount Hermon, and Jabal Shuf, in the highlands of Mount Lebanon. The syncretic beliefs of the Qarmatians, typically classed as an Isma'ili splinter sect with Zoroastrian influences, spread into the area of the Beqaa valley and possibly also Jabal Shuf starting in the 9th century. The group soon became widely vilified in the Islamic world for its armed campaigns across throughout the following decades, which included slaughtering Muslim pilgrims and sacking Mecca and Medina—and Salamiyah. Other Muslim rulers soon acted to crush this powerful heretical movement. In the Levant, the Qarmatians were ordered to be stamped out by the ruling Fatimid, themselves Isma'ilis and from whom the lineage of the modern Nizari Aga Khan is claimed to descend. The Qarmatian movement in the Levant was largely extinguished by the turn of the millennium. The semi-divine personality of the Fatimid caliph in Isma'ilism was elevated further in the doctrines of a secretive group which began to venerate the caliph Hakim as the embodiment of divine unity. Unsuccessful in the imperial capital of Cairo, they began discreetly proselytising around the year 1017 among certain Arab tribes in the Levant. The Isma'ilis of Wadi al-Taym and Jabal Shuf were among those who converted before the movement was permanently closed off a few decades later to guard against outside prying by mainstream Sunni and Shia Muslims, who often viewed their doctrines as heresy. This deeply esoteric group became known as the Druze, who in belief, practice, and history have long since become distinct from Isma'ilis proper. Druze constitute 5.2% of the modern population of Lebanon and still have a strong demographic presence in their traditional regions within the country to this day. Due to official persecution by the Sunni Zengid dynasty that stoked escalating sectarian clashes with Sunnis, many Isma'ilis in the regions of Damascus and Aleppo are said to have fled west during the 12th century. 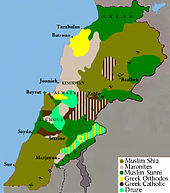 Some settled in the mountains of Lebanon, while others settled further north along the coastal ridges in Syria, where the Alawites had earlier taken refuge—and where their brethren in the Assassins were cultivating a fearsome reputation as they staved off armies of Crusaders and Sunnis alike for many years. Once far more numerous and widespread in many areas now part of Lebanon, the Isma'ili population has largely vanished over time. It has been suggested that Ottoman-era persecution might have spurred them to leave for elsewhere in the region, though there is no record or evidence of any kind of large exodus. Isma'ilis were originally included as one of five officially-defined Muslim sects in a 1936 edict issued by the French Mandate governing religious affairs in the territory of Greater Lebanon, alongside Sunnis, Twelver Shias, Alawites, and Druzes. However, Muslims collectively rejected being classified as divided, and so were left out of the law in the end. Ignored in a post-independence law passed in 1951 that defined only Judaism and Christian sects as official, Muslims continued under traditional Ottoman law, within the confines of which small communities like Isma'ilis and Alawites found it difficult to establish their own institutions. The Aga Khan IV made a brief stop in Beirut on 4 August 1957 while on a global tour of Nizari Isma'ili centres, drawing an estimated 600 Syrian and Lebanese followers of the religion to the Beirut Airport in order to welcome him. In the mid-1980s, several hundred Isma'ilis were thought to still live in a few communities scattered across several parts of Lebanon. Though they are nominally counted among the 18 officially-recognised sects under modern Lebanese law, they currently have no representation in state functions and continue to lack personal status laws for their sect, which has led to increased conversions to established sects to avoid the perpetual inconveniences this produces. War in the region has also caused pressures on Lebanese Isma'ilis. In the 2006 Lebanon War, Israeli warplanes bombed the factory of the Maliban Glass company in the Beqaa valley on 19 July. The factory was bought in the late 1960s by the Madhvani Group under the direction of Isma'ili entrepreneur Abdel-Hamid al-Fil after the Aga Khan personally brought the two into contact. It had expanded over the next few decades from an ailing relic to the largest glass manufacturer in the Levant, with 300 locally hired workers producing around 220,000 tons of glass per day. Al-Fil closed the plant down on 15 July just after the war broke out to safeguard against the deaths of workers in the event of such an attack, but the damage was estimated at a steep 55 million US dollars, with the reconstruction timeframe indefinite due to instability and government hesitation. Lebanese Shia Muslims are concentrated in the south Beirut and its southern suburbs, northern and western area of the Beqaa Valley, as well as Southern Lebanon.. The last census in Lebanon in 1932 put the numbers of Shias at 20% of the population (155,000 of 791,700). A study done by the Central Intelligence Agency (CIA) in 1985 put the numbers of Shias at 41% of the population (919,000 of 2,228,000). According to a 2012 CIA study, the Shia Muslims constituted an estimated 27% of Lebanon's population. In 2017, the CIA World Factbook stated that Shia Muslims constitute 28.4% of Lebanon's population. According to other sources, the Lebanese Shia Muslims have become the single largest religious community in Lebanon, constituting approximately 40 percent of the entire population. Al-Hurr al-Aamili (1624-1693) - A muhaddith and a prominent Twelver Shi’a scholar,Born in Jabal A'mel in southern Lebanon. Bahāʾ al-dīn al-ʿĀmilī (1547-1621) - An Arab Shia Islamic scholar, born in Baalbek in Lebanon, philosopher, architect, mathematician, astronomer and poet who lived in the late 16th and early 17th centuries and died in Safavid Iran. ^ "Lebanon-Religious Sects". Global security.org. Retrieved 2010-08-11. ^ "March for secularism; religious laws are archaic". NOW News. Retrieved 2010-08-11. ^ "Fadlallah Charges Every Sect in Lebanon Except his Own Wants to Dominate the Country". Naharnet. Retrieved 2010-08-11. ^ "Aspects of Christian-Muslim Relations in Contemporary Lebanon". Macdonald.hartsem.edu. Archived from the original on 2011-07-25. Retrieved 2010-08-11. ^ Maroon, Habib (31 March 2013). "A geneticist with a unifying message". Nature Middle East. doi:10.1038/nmiddleeast.2013.46. ^ a b Haber, Marc; Platt, Daniel E; Badro, Danielle A; Xue, Yali; El-Sibai, Mirvat; Bonab, Maziar Ashrafian; Youhanna, Sonia C; Saade, Stephanie; Soria-Hernanz, David F (March 2011). "Influences of history, geography, and religion on genetic structure: the Maronites in Lebanon". European Journal of Human Genetics. 19 (3): 334–340. doi:10.1038/ejhg.2010.177. ISSN 1018-4813. PMC 3062011. PMID 21119711. ^ Haber, Marc; Doumet-Serhal, Claude; Scheib, Christiana; Xue, Yali; Danecek, Petr; Mezzavilla, Massimo; Youhanna, Sonia; Martiniano, Rui; Prado-Martinez, Javier; Szpak, Michał; Matisoo-Smith, Elizabeth; Schutkowski, Holger; Mikulski, Richard; Zalloua, Pierre; Kivisild, Toomas; Tyler-Smith, Chris (2017-08-03). "Continuity and Admixture in the Last Five Millennia of Levantine History from Ancient Canaanite and Present-Day Lebanese Genome Sequences". The American Journal of Human Genetics. 101 (2): 274–282. doi:10.1016/j.ajhg.2017.06.013. ISSN 0002-9297. PMC 5544389. PMID 28757201. ^ "Sample Chapter for Nakash, Y.: Reaching for Power: The Shi'a in the Modern Arab World". Press.princeton.edu. 1914-05-29. Retrieved 2013-01-05. ^ Stefan Winter, The Shiites of Lebanon under Ottoman Rule, 1516–1788 (Cambridge University Press, 2010). ^ In the Shadow of Sectarianism: Law, Shi`ism, and the Making of Modern Lebanon - Max Weiss. Google Books. 2010-10-30. p. 58. ISBN 9780674052987. Retrieved 2015-01-12. ^ "Lebanon (From Semitic laban", to be..." Online Encyclopedia. Retrieved 2007-12-03. ^ Danny Rubinstein (6 August 2006). "The Seven Lost Villages". Haaretz. Archived from the original on 2007-10-01. Retrieved 2015-01-12. ^ Lamb, Franklin. Completing The Task Of Evicting Israel From Lebanon 2008-11-18. ^ "Report: Hizbullah Training Shiite Syrians to Defend Villages against Rebels — Naharnet". naharnet.com. Retrieved 2015-01-12. ^ Zoi Constantine (2012-12-13). "Pressures in Syria affect Alawites in Lebanon - The National". Thenational.ae. Retrieved 2013-01-05. ^ "'Lebanese Alawites welcome Syria's withdrawal as 'necessary' 2005, The Daily Star, 30 April". dailystar.com.lb. Retrieved 2015-01-12. The Alawites have been present in modern-day Lebanon since the 16th century and are estimated to number 100,000 today, mostly in Akkar and Tripoli. ^ Jackson Allers (22 November 2008). "The view from Jabal Mohsen". Menassat.com. Retrieved 18 January 2016. ^ "Lebanon: Displaced Allawis find little relief in impoverished north". Integrated Regional Information Networks (IRIN). UNHCR. 5 August 2008. Retrieved 18 January 2016. ^ "Lebanon: Displaced families struggle on both sides of sectarian divide". Integrated Regional Information Networks (IRIN). UNHCR. 31 July 2008. Retrieved 18 January 2016. ^ David Enders (13 February 2012). "Syrian violence finds its echo in Lebanon". McClatchy Newspapers. Retrieved 18 January 2016. ^ a b c Salibi, Kamal S. (1990). A House of Many Mansions: The History of Lebanon Reconsidered. University of California Press. pp. 118–119. ISBN 0520071964. ^ Mahamid, Hatim (September 2006). "Isma'ili Da'wa and Politics in Fatimid Egypt" (PDF). Nebula. p. 13. Retrieved 2013-12-17. ^ Salibi, Kamal S. (1990). A House of Many Mansions: The History of Lebanon Reconsidered. University of California Press. p. 137. ISBN 0520071964. ^ "Lebanon – Religious Sects". GlobalSecurity.org. Retrieved 2013-12-17. ^ "FIRST VISIT TO FOLLOWERS". Ismaili.net. 4 August 1957. Retrieved 2013-12-17. ^ Collelo, Thomas (1 January 2003). "Lebanon: A Country Study". In John C. Rolland. Lebanon: Current Issues and Background. Hauppage, NY: Nova Publishers. p. 74. ISBN 1590338715. ^ Bureau of Democracy, Human Rights and Labor (27 July 2012). "International Religious Freedom Report for 2011" (PDF). United States Department of State. Retrieved 2015-01-12. ^ Khalaf, Mona Chemali (8 April 2010). "Lebanon". In Sanja Kelly and Julia Breslin. Women’s Rights in the Middle East and North Africa: Progress Amid Resistance (PDF). New York, NY: Freedom House. p. 10. Retrieved 2015-01-12. ^ "Lebanon 2008 - 2009: Towards a Citizen's State" (PDF). The National Human Development Report. United Nations Development Program. 1 June 2009. p. 70. Retrieved 2015-01-12. ^ Ohrstrom, Lysandra (2 August 2007). "War with Israel interrupts rare industrial success story". The Daily Star (Lebanon). Retrieved 2013-12-17. ^ Lebanon Ithna'ashari Shias Overview World Directory of Minorities. June 2008. Retrieved 28 December 2013. ^ a b "2012 Report on International Religious Freedom - Lebanon". United States Department of State. 20 May 2013. Retrieved 17 January 2016. ^ a b c "Contemporary distribution of Lebanon's main religious groups". Central Intelligence Agency. Retrieved 2013-12-15. ^ a b Yusri Hazran (June 2009). The Shiite Community in Lebanon: From Marginalization to Ascendancy (PDF). Brandeis University. Retrieved 17 January 2016. ^ Ethnic Groups Worldwide: A Ready Reference Group - David Levinson. Google Books. 1998. p. 249. ISBN 9781573560191. Retrieved 17 January 2016. ^ حمادة, سعدون (2008). تاريخ الشيعة في لبنان. دار الخيال للطباعة والنشر والتوزيع. Retrieved 2015-01-12. ^ "The Shiites of Lebanon under Ottoman Rule, 1516-1788 - Book Reviews | Insight Turkey". insightturkey.com. Retrieved 2015-01-12. ^ Winter, S. (2010). The Shiites of Lebanon under Ottoman Rule, 1516–1788. Cambridge University Press. p. 47. ISBN 9781139486811. Retrieved 2015-01-12. Wikimedia Commons has media related to Shi'a Muslims from Lebanon. This page was last edited on 23 March 2019, at 13:44 (UTC).